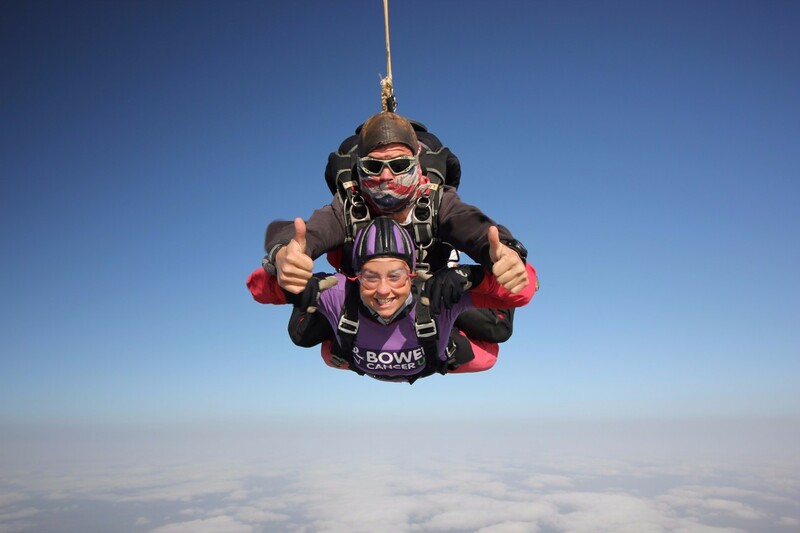 Take to the skies this October with us for the 2019 Big Jump for Bowel Cancer UK, our most exciting skydive day to date. We’re gathering our biggest number of supporters, at 3 airfields across the country to skydive on the same day, and to help stop people dying from bowel cancer. Experience the best views from 10,000 feet in the ultimate adrenaline rush, it’s a once in a lifetime experience and we would love to have you with us. To take part in The Big Jump for Bowel Cancer you must be aged 16 or above. You will be required to sign a medical form before you jump declaring your fitness to take part – this will be sent to you once you have reserved a place. Pre-existing medical conditions don’t mean you won’t be able to take part, but if you suffer from any of the conditions listed on the form you will need your doctor to agree it is safe for you to take part. Your doctor will need to complete a separate form found here. What's included? You will receive a Big Jump Welcome Pack, including a fundraising guide full of top tips to meet your target sponsorship, a T-Shirt to wear on the day and unlimited support from our events team.